Doris Emrick Lee was born and grew up in Illinois. She graduated from Rockford College, Illinois in 1927, then studied at the Kansas Art Institute with Ernest Lawson, and later in Paris with Andre L'hote. In 1930 she enrolled in Arnold Blanch's class at the California School of Fine Arts in San Francisco and married Blanch in 1939. Blanch encouraged her to transcend the forced Cubist explorations she had learned in Paris and to develop her more personal narrative depictions of childhood memories. With Thomas Hart Benton Grant Wood and John Steuart Curry, whose belief in American agrarian values she shared, she is classified as an artist of the American Scene. Unlike her colleagues, however, Lee's works are not deliberately politicized or nationalistic. Her rich portrayal of the panorama of rural life is conveyed through a vision of unselfconscious folk art like innocence. 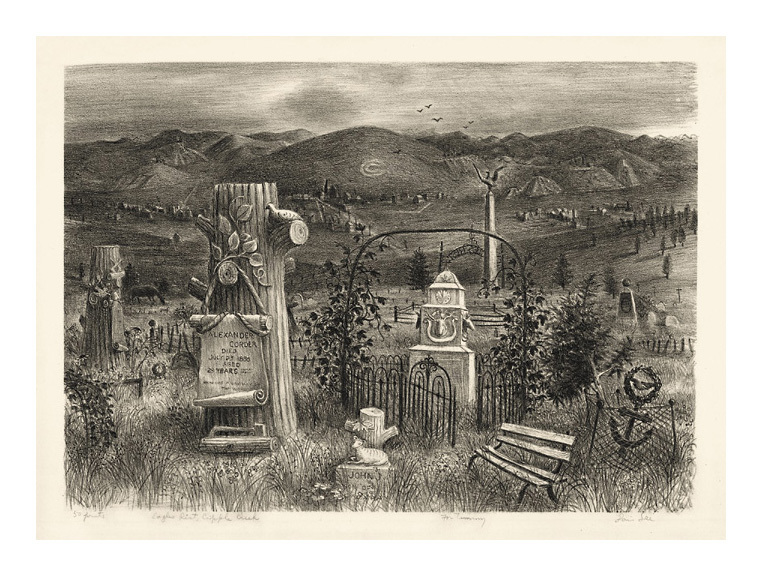 Eagle's Rest Cripple Creek- - c.1949, Lithograph. Edition 50. 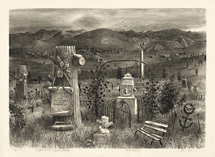 Signed in pencil, lower right; titled in pencil, lower left. Inscribed in pencil For Timmy. Sheet size 9 7/8 x 14 1/8 inches (251 x 359 mm); sheet size 13 1/4 x 20 1/8 inches (337 x 511 mm). Ex-collection Kennedy Galleries, with the original gallery mat.